For those of you who are familiar with me from the previous articles (Fighting My Body for Beauty & My Journey with Thyroid Doctors) that I’ve published with amazing Dana Trenti with Hypothyroid Mom; I wrote this article to provide you with some insight of how my health journey has carried on over the last few years. After being diagnosed with 8 different conditions back in 2015, I continued my journey forward to find the answers about my body and health that I knew I truly deserved. 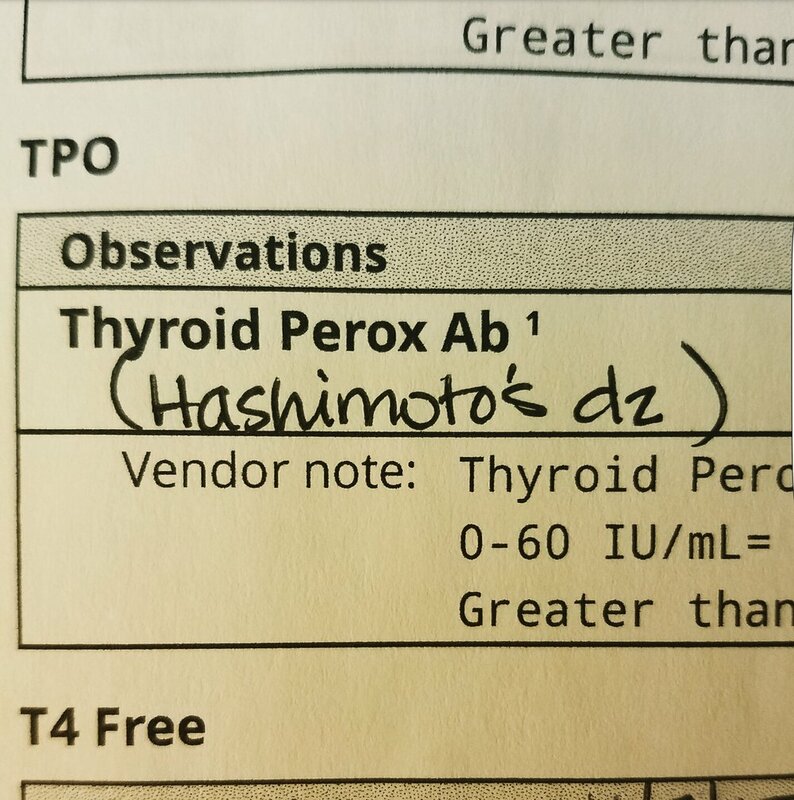 In 2016 I was tested for the 4th time to see if I had developed Hashimotos. It seemed to be the only answer my Naturopath could come up with surrounding my Thyroid tribulations. I dreaded those test results. I was at a point in my life with all the research I had conducted around Hashimotos, that I thought my life was for sure going to be 'over' if that diagnosis came back positive. I told myself that if that test came back positive, that was it; I wouldn't be having any children, I wouldn't want to subject a significant other to the ups and downs of this disorder, and I would fight this alone. I walked into my follow up appointment and laying on the desk in bold print with my name on the top of the document was the word I'd feared for so many years. Just sitting there, mocking me was the word HASHIMOTOS. To say that I was angry would be a severe understatement. I felt betrayed by every other health care professional I'd ever seen. Why had it taken this long to find this seemingly simple answer? I argued with that piece of paper, I argued with the blood results, I argued with my body; asking it countless questions about why it hadn't given me the signs sooner (even though it had). Mid sob session, I looked up at my doctor and said I want to fight this. I've heard of ways to rid it from the body, and I'm going to do exactly that. I refused to be defined by that diagnosis. I was going to have children someday, and I was going to re-define myself as worthy to be loved by not only others, but most importantly to be loved first and foremost by myself. I'd battled my thyroid symptoms for so many years already and in that moment I decided the only way to move forward from this was to take matters into my own hands. I had made many connections with men and women from all over the world after releasing my first 2 articles and the best piece of advice I had been given for ridding my system of the anti-bodies was a medication known as Low-dose Naltrexone. For those of you who haven't heard of it, there are some incredibly informative articles on this site that address its purpose in the Hashimotos world so many of us live in. Naltrexone itself is used in much higher doses to address the symptoms and withdrawals in chronic drug users. It helps to block the receptors in the brain that create the "high" effect some drugs give off; helping abusers to lower the rate at which they are using drugs. Medical studies have now found that given in 'micro doses', Low-dose Naltrexone can be used to effectively rid the anti-bodies that cause Hashimotos from the system. There were very few known risks to taking this prescription and I decided to dive right in. A local compounding pharmacy created a batch of capsules for me to start my first month's journey on this medication. The pharmacist provided me with as much education as she could and expressed to me how excited she was for me to try this process. She informed me I would be experiencing some vivid dreams for the next several weeks, but otherwise that was the only side-effect anyone had reported back to her. She then asked me to keep a journal of my thyroid symptoms and how they were progressing as I went through my treatment. This particular pharmacist had been following the medical journals on Low-dose Naltrexone for many months, and was very intrigued to work with someone directly on this matter. The pharmacist was 100% correct on the vivid and sometimes peculiar dreams. I experienced those for almost 3 weeks, but continued to achieve restful and deep sleep each evening, despite the extreme curiosity for my subconscious’s dream selection. I continued taking the recommended doses for 1 month, then dropped down to the lower dose recommended by my physician. I took the prescription for just shy of 6 months before seeking out another blood test to find out if my levels had shifted. The results of my next blood test completely blew my mind. In less than 6 months, my thyroid anti-bodies had become clinically insignificant. For those of you who don't know what that means...it means they were GONE! That's right, you read that correctly. The anti-bodies that were once attacking my thyroid were no longer significant enough to show up in a blood test. Did that mean I was completely rid of my Hashimotos? Unfortunately, no. Now that my body had developed the anti-bodies, it was something that could always stir back up later down the line. However, in this moment I was Western Medicine's version of Hashimotos FREE. The number of emotions that overcame me were so vast I couldn't hardly stand. I felt liberated, powerful, relieved, and so amazed at how my body was actually healing. I had lost faith in the power of my body so long ago as I battled one illness after the next. Now that I had my Hashimotos temporarily under control, my next task was to discover the underlying causes of my digestion issues. What I didn’t know is that I had finally found the right group of medical providers, mentors, and coaches to regain control over my own health. 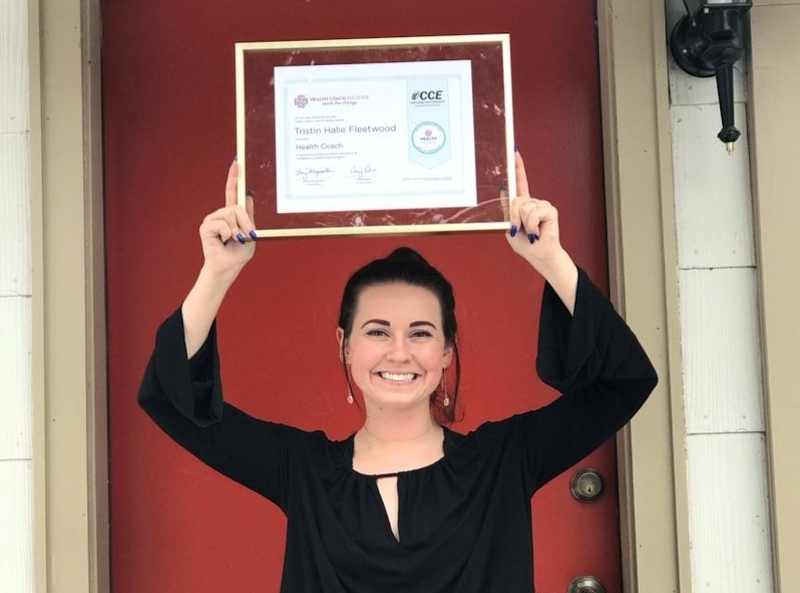 I was so inspired by my personal Health Coach that I began my Certification Training for Health and Wellness Coaching in 2016. During my training, in July of 2017 I was sent to Mayo Clinic in Rochester, MN where they found that I had an active staph-infection which had likely been plaguing my body for over 10 years. The infection had caused issues with my Thyroid, Digestion, Adrenal Glands, Sleep Patterns, White Blood Cell count, and more. Once we isolated the infection and began treatment, I was quickly able to function like a normal (I've never been all that normal, it makes life a little more fun) 24 year old. I was still left with damage from the infection; in my body's desperate attempt to heal itself, my adrenals suffered greatly and the fatigue was undeniable. However, through my training to become a Health Coach, I learned to develop a very specific self-care routine to help repair my adrenals, and to lessen the taxing effects that daily anxiety was putting on my still healing body. Another piece to my Mayo Clinic endeavors that was nothing short of shocking to me was my diagnosis of Pelvic Floor Dyssynergia. This condition doesn’t allow the pelvic floor muscles to relax properly, particularly during a bowel movement. With a few semi-invasive yet simple tests, the gastroenterologists were able to diagnose this disorder in less than a day. After having a half a dozen other doctors diagnose me with IBS (irritable bowel syndrome) time and time again, this new discovery made so much more sense. While in Rochester, I took part in 2 brief sessions of bio-feedback training, which is essentially Physical Therapy of the pelvic floor monitored with electronic devices. After these sessions, I was able to understand so much more about how my body was processing food and trying to dispose of the waste material, simply by learning which muscles were functioning improperly. Upon returning back to my home in Bozeman, MT I was participating in pelvic floor physical therapy on an at home basis 3-5 times a day. My digestion and bowel movements drastically improved and are still improving to this day. Where I used to have ZERO relief with my constipation and diarrhea, I now have an understanding of my body and am able to work with it instead of against it. Even after all this initial healing, I still experience migraines, but on a much less frequent basis; and I manage my compromised immune system and thyroid through a combination of Chinese Medicine and lifestyle care (coaching, counseling, proper diet, acupuncture, massage, exercise, meditation, chiropractic and LOTS of self-care.) I battled my medical issues without a health coach for over 10 years, and within months after seeking out a Coach of my own, I was able to sort out my priorities and embark on my very specific journey towards better health. This made becoming a Certified Health Coach one of the easiest decisions in my life. I never dreamed in my mid 20's I would have already published 2 Health Articles on a site that has over a million followers, or that I would have had the opportunity to have men and women from all over the world reach out to me telling me that my story had made them feel less alone. Growing up, all I ever wanted was to not feel alone in my medical chaos. Had I known then what I know now, I would've looked at, and loved the world a little differently as a child/young adult. Now my goal is to inspire and empower as many people as my words and physical being come into contact with. I want to help people believe in their bodies and the power they may not know they possess within themselves. I want to inspire positive body talk, and that by gaining a sense of belief in our body's innate ability to heal itself, we can physically alter the state of our health. I believe if I can inspire someone to stay strong through their tough times, remain true to their wants and beliefs, and express the realest version of themselves; then I've served my purpose on this planet. - Thank you ALL for following my journey these last few years and for providing me with the inspiration and information I needed to become EXACTLY who I am in this moment. I am forever grateful! Older PostMy Journey with "Doctors"